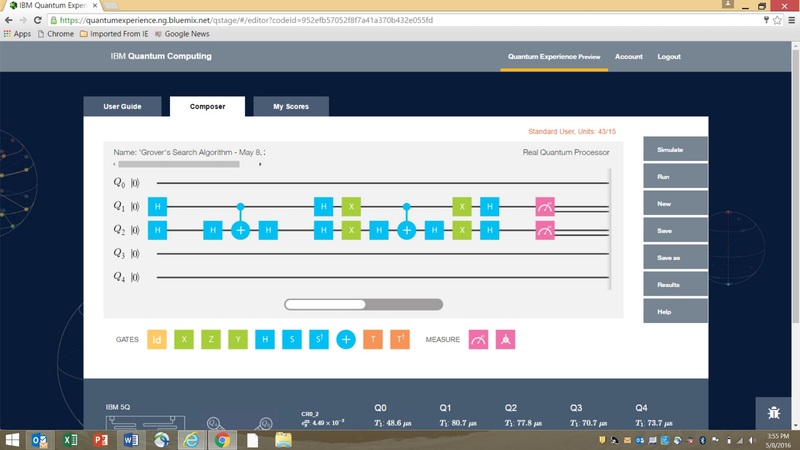 IBM generated a lot of publicity and a little controversy last week when they announced the IBM Quantum Experience that allows members of the general public to configure and run programs on a 5 qubit quantum computer that they have made available on the web. 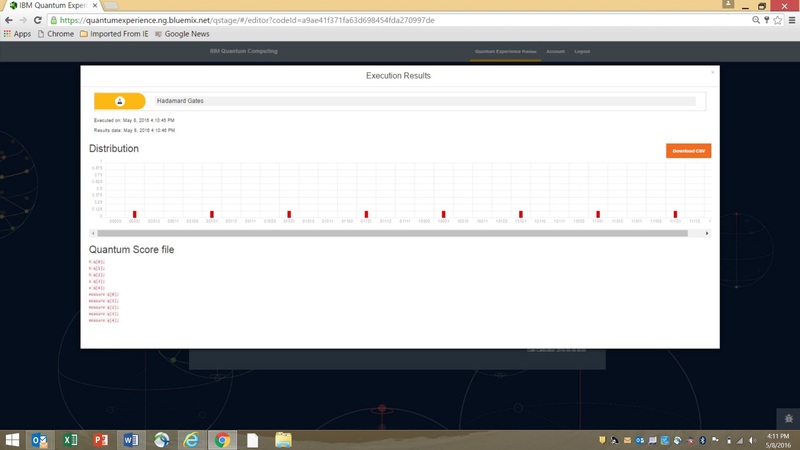 IBM granted me access to this capability and I have been using it for the past few days and here are my first impressions. Run on a simulator of an ideal quantum processor. Ideal means there would be no decoherence errors. Run on a simulator of a real quantum processor. This realistic simulation would take into account a probabilistic model of what errors may occur to decoherence. 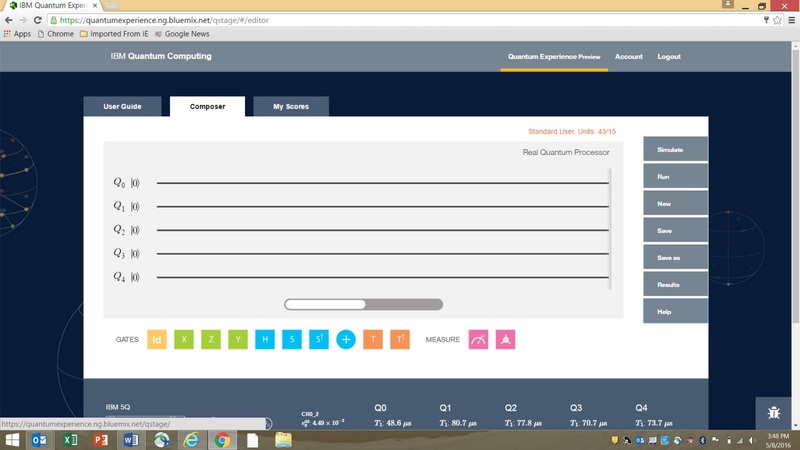 Run the score on the actual quantum processor that IBM has put on the web. Since there may be multiple users who are doing this or the processor may be unavailable for temporary maintenance, IBM will queue up the requests and run these in a batch mode. After your job is done IBM will store the results in the data base and send you an email notifying you that the job has completed. There is no limit to the number of simulator runs allowed. However, IBM does ration the number of runs on the actual processor with a system of processing units that they will periodically provide you. You can view the results section to see the final output. Depending upon what type of measurement block you put at the end, it will show you a bar chart showing the probabilities of each end state or it will show you a Bloch sphere that will show the complete state of the qubit in three dimensions. Example showing the Bloch measurement of the individual qubits. IBM deserves a lot of credit for implementing this. It is a good tool for students and researchers. But it is not clear if there is any value outside of the “gee whiz” value of including an actual quantum processor with this. At 5-qubits, the simulator will provide almost the same results and we would not be able to tell the difference. Google and Microsoft have created similar capabilities but did not promote it as much as IBM did. 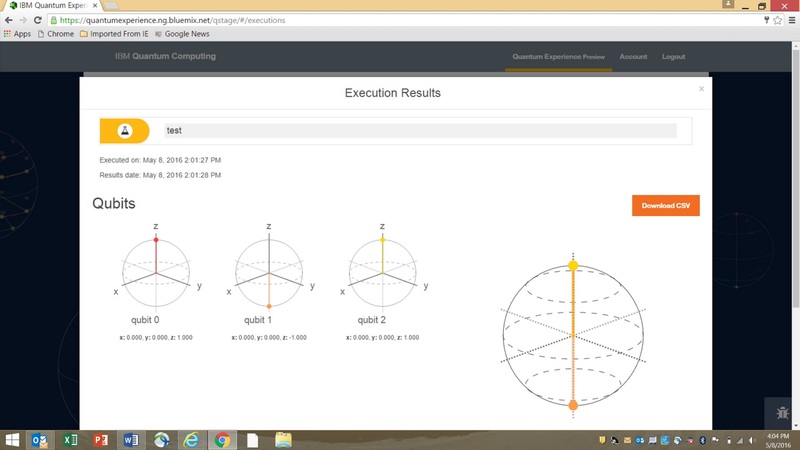 Google released the Quantum Computer Playground in 2014 and Microsoft released last a full simulator called LIQUi|>, standing for Language-Integrated Quantum Operations. But I like IBM’s capability more, at least from an educational standpoint, because of its nice graphical user interface and the tutorial included in the user guide. The only point of controversy is whether the IBM Marketing folks might have been a little too enthusiastic by hinting that this was a full capability open to the general public rather than just some educational and experimental technology they are making available to students and researchers.. The title of their press release was “IBM Makes Quantum Computing Available on IBM Cloud” and the release did get heavy play in the general media. For an alternate view, you can read Chris Williams opinion as published in the TheRegister. In some of the press statements, IBM seems to be indicating that their direction for real commercialization is to make quantum computing available in the cloud. This coincides with a believe that many folks hold, including myself. But even then, it may be several years before this becomes a reality and even then it will generate just a very small fraction of IBMs total yearly revenue.